The historic building which houses The Chapelle Street Casitas is located on a quiet residential street, an easy four block walk from the Plaza, and just around the corner from the Georgia O'Keeffe Museum, great restaurants, shopping and historic sights! A perfect location in the heart of the city - off street parking, Cable TV, private phones and size! Not just a room! Three of the Casitas have full kitchens, queen beds in the bedrooms, private baths and living rooms (two casitas have queen hide-a-bed sleeper couches in the living room). 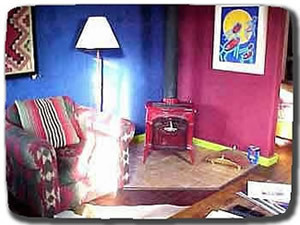 The fourth Casita is a large suite with two twin beds, a seperate breakfast area (not a full kitchen) and a private bath. Built at the turn of the century and remodeled in 1994, they have a wonderful historic quality and are in one of the best locations in town!